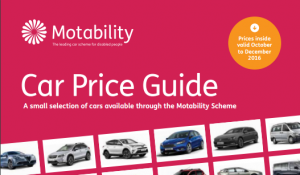 Download the current Motability Price Guide. Motability is a charity that since 1977 has helped over 4 million people to get mobile by exchanging their mobility allowance to lease a car. If you receive the Higher Rate Component of the Disability Living Allowance, the Enhanced Rate of the Mobility Component of Personal Independence Payment (PIP), the War Pensioners’ Mobility Supplement (WPMS) or the Armed Forces Independence Payment (AFIP) you may be eligible to join the Motability Scheme. The RAC Motability Assist helpline and roadside staff are specially trained to handle your calls and are available 365 days of the year. When you take delivery of your car, it will be already taxed for the first year. If you live in Great Britain or Northern Ireland, Motability will arrange for your vehicle to be taxed for the duration of your lease. For no extra cost, tyres that are worn or damaged by normal use will be replace by Kwik Fit, repair and replacement window/windscreens are also included in the lease. With the lease of your vehicle you will get an allowance of 60,000 miles over the three years, however when the vehicle is handed back and the total mileage is higher, then there is a charge of 5 pence per mile.